Ricin suspect Paul Kevin Curtis has been released from jail as the US authorities have dropped the charges against the Mississippi man accused of sending letters poisoned with ricin to President Barack Obama and Senator Roger Wicker. 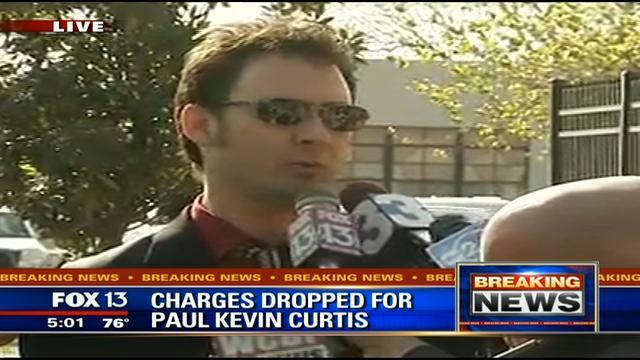 Paul Kevin Curtis was freed on Tuesday after prosecutors revealed the investigation had uncovered “new information”. The letters addressed to Barack Obama and Republican Mississippi Senator Roger Wicker tested positive for the presence of the lethal toxin this month. Meanwhile, investigators in the case are searching the home of another man. Paul Kevin Curtis was arrested last week at his home in the town of Corinth, Mississippi and charged with sending letters to Barack Obama, Roger Wicker and a judge from Lee County. But on Monday authorities searched Paul Kevin Curtis’ home and found neither ricin nor ingredients for the poison, an FBI agent testified in court. A search of his computer yielded no evidence he had researched how to make the toxin, the agent said. In a news conference outside the courthouse on Tuesday, Paul Kevin Curtis thanked his family, friends, Jesus, Senator Roger Wicker and President Barack Obama. Paul Kevin Curtis, a musician and Elvis impersonator who also said he was a certified reflexologist, added: “I love my country and would never do anything to pose a threat to [Barack Obama] or any other US official. He was already well known to Senator roger Wicker because he had written to the Republican senator and other officials. Paul Kevin Curtis’ lawyer Christi McCoy, whom Curtis described as a blonde, blue-eyed angel sent by God, told reporters she believed the FBI agents who had arrested and charged her client had “acted in good faith”. Christi McCoy said she was unsure what new information prosecutors had but that the plot to frame her client was “very, very diabolical”. As the case against Paul Kevin Curtis appeared to collapse on Monday and Tuesday, another man in nearby Tupelo, Mississippi, told the Associated Press authorities were searching his home in connection with the ricin letters. Everett Dutschke said he was innocent, and the Associated Press reported agents from numerous law enforcement agencies had established a mobile crime lab near his home. “I don’t know how much more of this I can take,” Everett Dutschke said. No charges have been filed against him nor has he been arrested. The search team also combed through an area of woods and ditches about a block from Everett Dutschke’s property. Everett Dutschke said he and Paul Kevin Curtis had had a dispute, cutting off contact in 2010, after he threatened to sue Curtis for saying he was a member of Mensa, a group for people with high IQs. “I’m a patriotic American,” Everett Dutschke, who unsuccessfully ran for a seat in the Mississippi House of Representative in 2007, said.